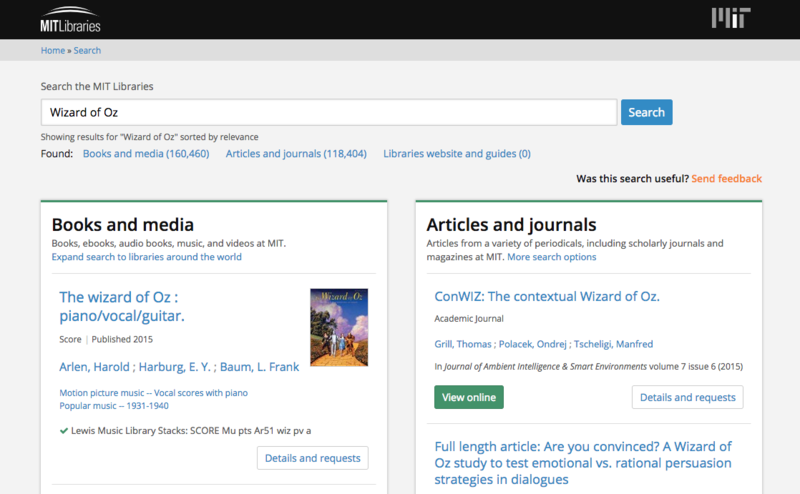 The new default search offers a quick way to get to books, CDs, DVDs, articles, journals, and website information. This “quick search” searches our library catalog and several databases of article content from many scholarly journals, popular magazines, and other periodical publications (though it is not exhaustive). The results are grouped into scannable areas to make it easy to find what you’re looking for. The results are sorted by relevance, often pulling relevance from the full text of the item, not just the catalog record information. The new quick search is an early stage project aimed at improving the search results and experience for our community, especially for simple and known-item searches. Searching for information in the Libraries can often be confusing and fractured because information and resources are gathered from a wide variety of sources, which are siloed in separate tools. This project uses APIs to bring these sources together in one customized interface that will better meet user needs. While the current phase is modest, we aim to continue to add functionality, improve the results and reliability of links to online content, and bring in more of our resources over time.